Are you looking for a standalone server that is both affordable and flexible for your small business? The HPE ProLiant ML10 v2 Server is a single-socket 4U tower server, delivering excellent value that small businesses require to run a small network environment. It provides entry-level businesses with an affordable server that can be used as a standalone tower configuration. It is outstanding for businesses looking for a server with low acquisition cost, increased connectivity slots for storage and networking, optimized compute with built-in reliability, and agile management. Supports Intel® Xeon® E3-1200 v3 processors for improved performance. PCIe Gen3 supported for increased bandwidth. Up to six, internal Large Form Factor (LFF) hard disk drives for increased storage capacity. The HPE ProLiant ML10 v2 Server offers the right server technology for small businesses looking for just the right performance and features at an affordable price. Embedded HPE Integrated Lights-Out (iLO 4) remote and out of band management allows network administrators to easily check and update servers remotely, reducing any offsite travel expenses. Pre-Installed with 2x1GbE and up to four (4) PCIe slots to adapt and grow to meet changing business needs. 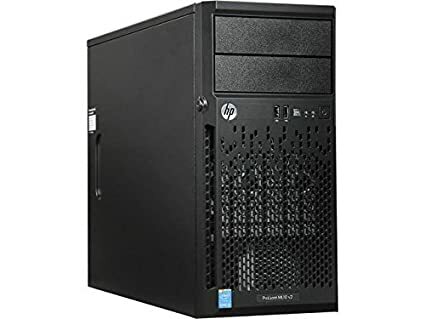 The HPE ProLiant ML10 v2 Server design allows for easy installation and convenient expansion to meet business needs, with support for up to six (6) large form factor (LFF) hard disk drives, four (4) USB ports, and four (4) I/O slots. Designed with two (2) 2x1Gbe NIC ports for better networking experience and higher availability. The ML10 v2 Server delivers many years of expandability and operational efficiency for businesses at a desktop price. The HPE ProLiant ML10 v2 Server comes standard with four (4) DIMM slots for Error Correcting Code (ECC) memory that protects businesses data from data loss and unplanned system downtime. The HPE Dynamic Smart Array B120i provides an embedded 6Gb/s SATA controller RAID solution for customers who use SATA drives for both boot and data to protect critical data from loss of a disk drive. It supports the Intel Xeon E3-1200 v3 processor in a 4U chassis offering improved performance and efficiency. Offered in a large server chassis size to allow for maximum air flow helping to reduce component failure. The HPE ProLiant ML10 v2 Server offers essential management for control, and optimization of HPE ProLiant servers with HPE Insight Control. Online personalized dashboard for Converged Infrastructure (CI) for support management with HPE Insight Online. Optimize firmware and driver updates and reduce downtime with HPE Smart Update, consisting of HPE Smart Update Manger (SUM) and Service Pack for ProLiant (SPP).